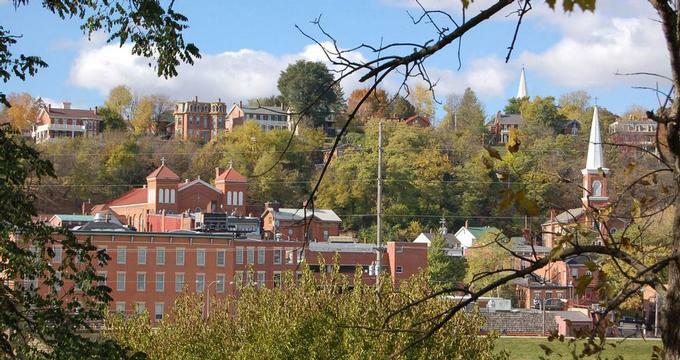 Galena, Illinois, is a great place to visit on a romantic weekend getaway or with kids. A large portion of the city is listed on the National Register of Historic Places and there are many historical sights to explore. Visit the Ulysses S. Grant Home, take a tour of the Elihu B. Washburne House, Dowling House and the Old Market House. 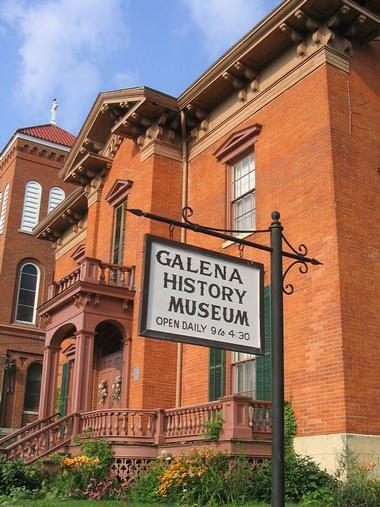 Here are the best things to do in Galena, IL. The Ulysses S. Grant Home is the former home of Civil War General and 18th President of the United States, Ulysses S. Grant. Designed by William Dennison and built in 1860, the house was donated to General Grant as a token of appreciation for his outstanding service during the war, and it has been maintained as a memorial ever since. Located on Bouthillier Street, the U.S. Grant Home is furnished with mid-1860s furniture and décor that once belonged to the Grant family. Interpreters dressed in period costumes lead group tours that detail Grant's activities during the Civil War through to his presidency. Designated as a National Historic Landmark and listed on the National Register of Places, the Ulysses S. Grant Home is managed by the Illinois Historic Preservation Agency. Founded in 1938, the Galena-Jo Daviess County Historical Society was founded to educate and enrich the public about the history and material culture of Galena and Jo Daviess County. The society is home to the Galena & U.S. Grant Museum and their various resources and exhibits, displays, and educational programs bring the history of the region alive. The society hosts a variety of historical and educational events throughout the year, including Historic Homes Tours, Cemetery Walks, Galena in Maps, and Peace in Union. The museum has excellent exhibits that focus on important aspects of the region from lead mining in the Northwest and the construction of Port Galena to the history of the Vicksburg Flag and the role women played in the development of Galena. Group tours of the History Museum and The Old Blacksmith Shop are offered and can be booked in advance. Chestnut Mountain Resort is popular mountain and ski resort spanning 220 acres and featuring a variety of snow-based activities. Perched high on a ridge overlooking the Mississippi River in the hills near Galena, the resort boasts 19 ski snowboard trails up to 3,500 feet in length and cut through solid rock bluffs to create challenging courses. A seven-acre all-terrain park called The Farside has its own triple and offers a quarter-pipe, two halfpipes, and plenty of rails, kickers, and jumps for all levels of snowboarder, while an exhilarating 475-foot vertical drop draws adrenaline junkies from around the country. The Chestnut Hotel offers comfortable accommodation, excellent restaurants, cafés, and bars and an indoor swimming sauna and Jacuzzi for après-ski relaxation. Located at 908 Third Street in Galena, the Elihu B. Washburne House was built in 1845 for local politician Elihu Benjamin Washburne, and it stands today as an outstanding example of the architectural Greek-Revival style. The house has a rich history of occupation by famous people, including Elihu Washburne, a political adviser to Abraham Lincoln and Ulysses S. Grant and the ambassador to France in the mid-1800s. The temple-like front portico and towering pillars of the house reflect the characteristics of the Greek-Revival style, which was a traditional building style during that period, and the house serves as an excellent example of architecture for history buffs and architectural aficionados. Listed on the National Register of Historic Places, the house is managed by the Illinois Historic Preservation Agency and is open to the public to explore on self-guided or organized tours. Built in 1845 in the Greek Revival style, the Old Market House was constructed by the city to serve as a town hall and enclosed farmer’s market, forming a community hub during Galena’s “Golden Era.” The Old Market House served as a meeting place for the community to discuss important city issues, and it was also home to a variety of vendors selling their wares. Shoppers would gather here to shop, meet, and catch up on news. The Old Market House was restored to its former glory in 1955 and currently operates as the Galena Welcome Center, managed by the Illinois Historic Preservation Agency as an Illinois State Historic Site. 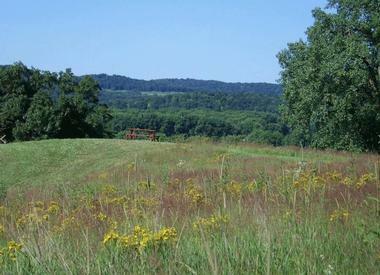 Located in the heart of historic downtown Galena, P.T. Murphy Magic Theater is a private 24-seat theater that presents a variety of intimate magic shows. Casper Bluff Land & Water Reserve is an archeologically significant site that boasts breathtaking views of the Mississippi River bluffs and presents an array of outdoor activities such as walking, hiking, bird watching, and sightseeing. The 85-acre area features two archeologically significant Native American sites, namely the Aiken Mound Group and the Effigy Mound, both of which boast evidence of early civilization and their way of life. The reserve is home to a variety of bird species, making for excellent bird watching as well as spectacular scenic views of the surrounding countryside. Built in 1826 by John Dowling, Dowling House is Galena's oldest house and a beautiful example of early nineteenth-century architecture and design. Once the only trading post in the city, the house was built of limestone and equipped with primitive living quarters to host the many fur traders who frequented the area during this time. Nestled on a hillside overlooking Galena, Linmar Gardens is a privately owned three-and-a-half-acre garden that has been beautifully landscaped and curated to provide a secluded and tranquil space in which to relax in nature. Linmar features a variety of individual gardens such as The Four Seasons Garden with a 20-foot waterfall dropping off a natural bluff and an array of unique sculptures by local artist John Martinson, and the centerpiece Sunken Garden, which forms the foundation of an African-American Baptist Church. The West Street Sculpture Park is an outdoor space that features more than a dozen large, welded steel sculptures by John Martinson that are scattered around two acres of beautiful parklands. Open year-round from dusk to dawn, the park boasts a variety of contemplative artworks, unique signs, and quirky assemblages, as well as two massive 40-foot towers and a giant tinker toy. Winding wooden paths through the park make exploring easy, and maps are available for visitors to enjoy a self-guided tour around the grounds, where plaques identify pieces of art and sculptures. The park is also home to an on-site studio where John Martinson creates his works and some of which can be bought. More vacation ideas: Romantic Restaurants San Francisco/a> and Best Restaurants in Seattle. The Galena Center for the Arts was established to celebrate regional arts and artists, as well as to inspire the public and educate them on the importance of art in society today by showcasing high-quality art in an inviting atmosphere. Developed from the Galena Vision2020 study, the center features a large exhibition space for special exhibitions, a regional artwork gallery, which presents photography displays from the historic Alfie Mueller collection, and a performance venue that hosts a range of artistic performances and educational spaces. The Galena Center for the Arts also hosts a variety of special events throughout the year, including The Art of Craft and the Youth Arts Festival. Fun destinations: Things to Do in Houston and Best Lake Vacations. Miss Kitty’s Grape Escape is a retro bar serving wine, beer, and signature martinis along with classic bar fare such as sandwiches, nachos, and burgers in a convivial setting. Located in the heart of downtown Galena, Miss Kitty’s combines a laid-back lounge vibe with a modern, river town design to create a warm and welcoming atmosphere that attracts locals and visitors alike. The pub-grub-style menu features favorites such as nachos and salsa, warm bruschetta topped with tomato basil and mozzarella, wraps, and seafood platters, as well as homemade desserts. Best known for their famous martinis, the bar also presents an extensive list of diverse wines, liquors, and beers, and visitors can enjoy live music every Friday and Saturday night and the fun-filled Miss Kitty's Quiz Show on Sundays. The Old Blacksmith Shop is an authentic blacksmith shop dating back to 1897, complete with working forges, original equipment, and tools. The shop itself is a museum where visitors can explore the history of forging in Galena, how it works, and the role it played in the town. They can also watch live demonstrations by expert blacksmiths as they operate the forges during the season. 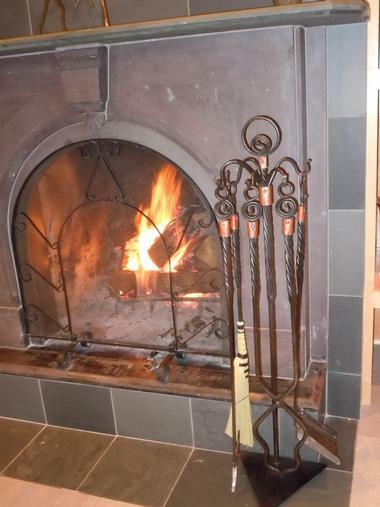 A well-stocked gift shop offers a range of memorabilia and gifts made by the blacksmiths in the foundry, from handcrafted jewelry to ornate fireplaces. The Old Blacksmith Shop is open Friday through Monday during the months of May to October. Galena Cellars Winery & Vineyard is a family-owned and operated vineyard and winery that has been producing wine for over 40 years. Owned by the Lawlor family, Galena Cellars have created a family legacy that spans three generations. 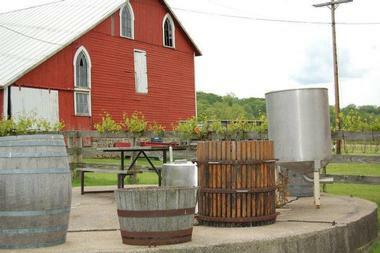 They produce more than 60,000 gallons of wine per year of 40 wine varieties from 22 different specialty grapes. Galena has three tasting rooms in various locations where visitors can sample some of the estate’s finest wines, and they offer both private and public tours of the winery and vineyard, as well as wine tastings and cheese and chocolate pairings. Private vineyard tours last about an hour and include a brief history of the farm, an in-depth look at the wine-making process, and a detailed tour of the vineyard, wine cellar, barrel and bottling room, and the tasting room for a sensory wine program. Galena Cellars Winery & Vineyard hosts several wine-related events throughout the year, including Wine Lover’s Weekends and Lunch at the Vineyard. © Blaum Bros. Distilling Co.
Blaum Bros. Distilling Co. is a family-owned and operated craft distillery in the heart of Galena that produces a range of premium spirits, including whiskey, vodka, and gin. Founded in 2013 by two brothers whose love for whiskey led them to set up a distillery, Blaum Bros. Distilling Co. produces an array of high-quality spirits, including bourbon, gin, vodka, and the unique Blaum Bros. Galena Reserve. 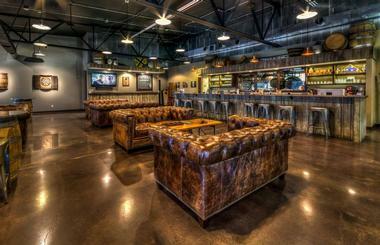 The distillery offers daily tours, which include a comprehensive look at the art of distilling and visits to the distillation area, the barrel room, and the comfortable tasting room and cocktail bar where visitors can sample the distillery’s tipple. A small gift shop offers a variety of memorabilia and products from the distillery to take home. 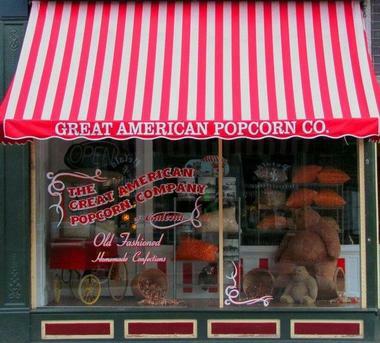 The Great American Popcorn Company is a quaint shop in the heart of Galena that sells delicious gourmet popcorn treats, including the famous Old Fashioned Caramel Corn. Founded in 1994 by owner Dave Lewis, the Great American Popcorn Company offers over 50 flavors of popcorn in store daily, ranging from French Vanilla and Bacon & Cheddar to Cheezy Caramel, Spicy Italian, and Kitchen Sink! The famous store not only sells freshly made popcorn and popcorn products but also offers a wide variety of other mouthwatering treats such as homemade fudge, candies, handmade chocolates, and ice cream. The Galena Brewing Company is the first brewery in Galena since the days of Prohibition, and it produces and serves 12 delicious brews and features a fantastic pub menu with dishes made from local ingredients. 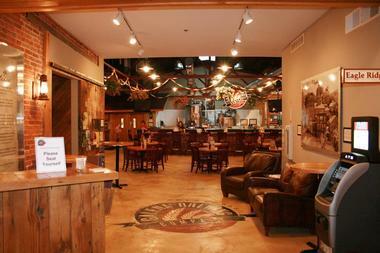 Owned by Warren and Kathy Bell, Galena Brewing features a tap and tasting room where visitors can learn about the beer-making process and sample the end products on guided Brewery Tours every Friday and Saturday. An inviting bistro offers a menu of classic pub grub ranging from sandwiches, salads, and wraps, to burgers, steak, and chicken wings, and guests can enjoy live music and other entertainment on weekends. Galena Brewing Company™ brews include the award-winning Anna Belle’s IPA, Uly’s Dark Oatmeal Stout, and Uptown Brown Ale. Blaum Bros. Distilling Co., Galena, IL, Photo: Blaum Bros. Distilling Co.